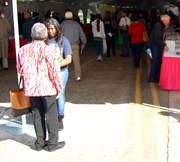 Louisiana Book Festival - Volunteer! 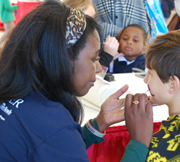 Book-loving volunteers are essential to the Louisiana Book Festival's success. 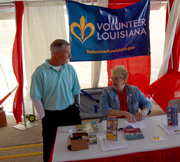 Whether it's escorting authors, guiding visitors, selling refreshments, working with children in the Young Readers Pavilion or other fun and rewarding assignments, the Louisiana Book Festival wants you to join the volunteer team. These pages are designed to give you necessary volunteer information as well as general information about the festival. Volunteers for the festival are being sought from all over the state, especially from Baton Rouge and surrounding areas, including employees of local businesses; librarians from public, academic, school and special libraries; high school, undergraduate and graduate students; Louisiana writers; and book lovers in general! If you have any questions, please call 225.342.4996 or email lbfvolunteer@state.lib.la.us.